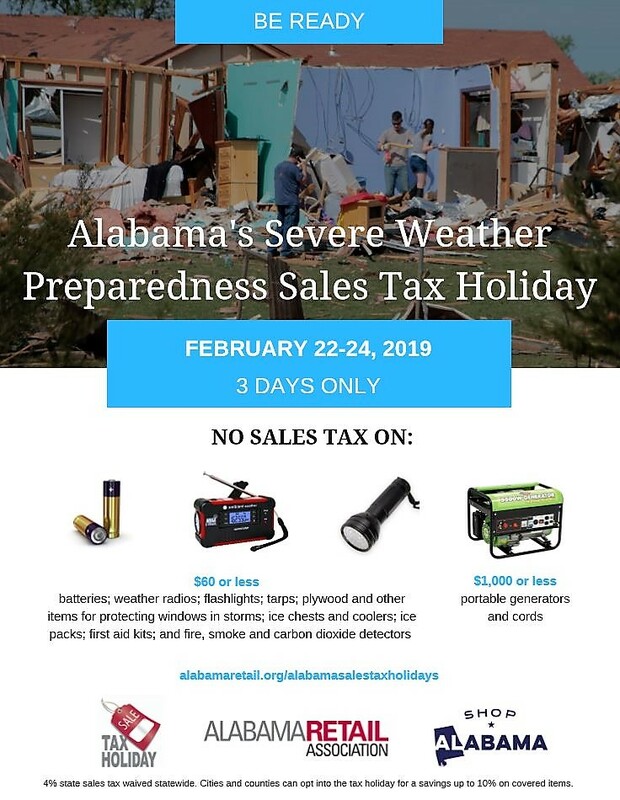 From Friday, Feb. 22, to Sunday, Feb. 24, Alabama is observing its eighth annual Severe Weather Preparedness Sales Tax Holiday. The Alabama Retail Association is among those encouraging Alabamians to restock emergency supplies in homes, workplaces and vehicles during this three-day tax holiday. Certain emergency preparedness items will be exempt from the state’s 4-percent state sales tax, and in some cities and counties, local taxes are waived on those items as well. It means shoppers can save as much as 10 percent on these items in some areas of the state. To see if your communities have decided to participate, click on the 2019 Participating Cities and Counties link. Other tax-free items include: Coolers, ice packs, plywood, window film and smoke/fire/carbon monoxide detectors. Portable generators and power cords costing $1,000 or less are also tax-free. 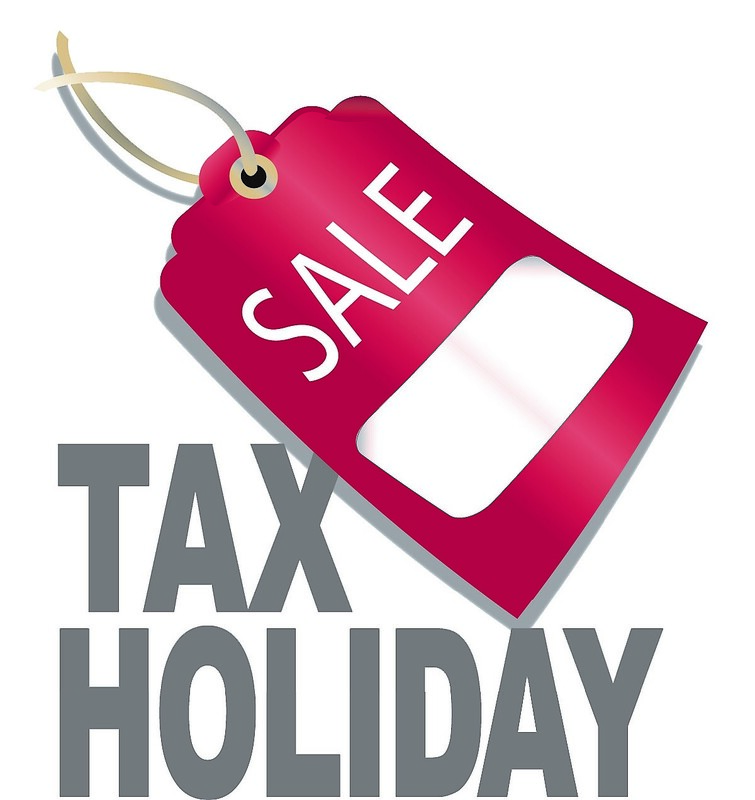 Alabama is one of three states with a severe weather preparedness sales tax holiday in 2019; the other states who have similar holidays are Texas and Virginia. Local hardware stores are stocked with emergency preparedness items for the tax holiday, including Mary Carter Store in downtown Cullman. 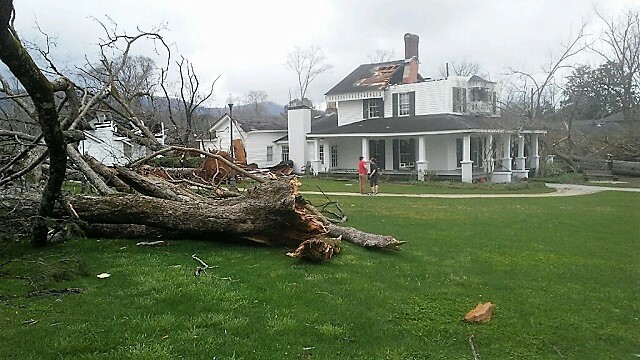 Owner Raymond Young says that preparing for severe weather is personal for him, as Mary Carter Store itself has sustained significant damage from two separate tornados; once in the early ‘90s and most recently in 2011, which left much of downtown Cullman in disarray. 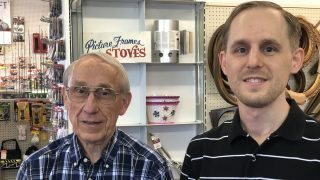 “That year, we were just giving people tarps and selling supplies, just doing anything in order to help, even though we suffered just as much damage,” said Raymond’s oldest son, Jeff, who also works at the store. “Now, we make sure we always have plenty of those items, and the tax holiday is a good time for families to stock up,” he added. 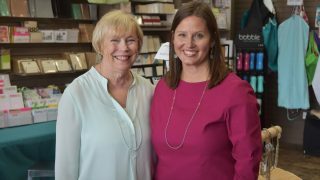 Read more about how Mary Carter Store helps customer prepare for all weather situations. Alabama Retail recommends having enough supplies in emergency kits to last 72 hours following a disaster. For information on what items to include in emergency kits, as well as steps to take before and after disasters, visit ready.gov. Meteorologists James Spann and Meaghan Thomas show you what to include in your storm safety kit from Alabama NewsCenter on Vimeo. The 54-year-old family hardware store mixes old-fashioned charm with modern technology. For the Mountain Brook stationery and gift store, it’s all in the details. 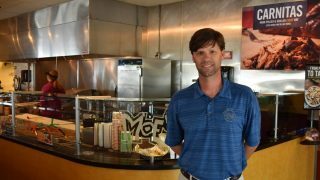 Owner Jeff LaCour aims to make customers for life.